WPA algorithm is very secure, and to get the password usually we have only one way – to brute force it, which could take huge time if password is strong enough. But what if instead of using regular CPUs we would use a power of GPU? Amazon says, that we can use up to 1,536 CUDA cores on g2.2xlarge instance, which costs $0.65 per Hour. Sounds very promising, so let’s see how it can help us to speed up password brute force. 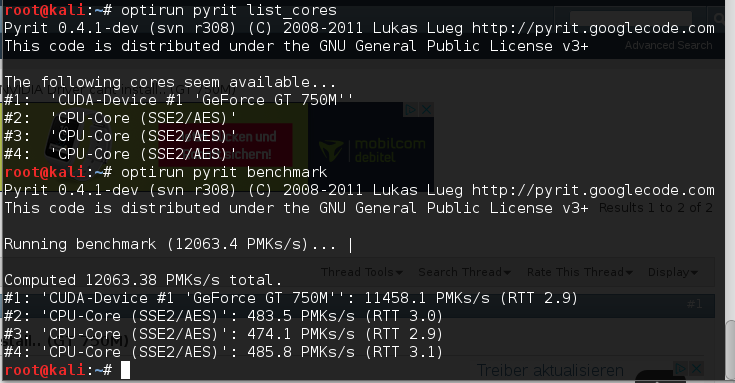 Below I will give step-by-step tutorial on how to deploy Amazon GPU instance and run pyrit (python tool) to crack password using GPU. In this article I assume that you are already familiar with aircrack-ng wi-fi cracking tools. And you’ve already captured handshake into .cap file. ssh -i your_aws_key.pem ubuntu@your-instance-dns.com cat /etc/lsb-release > DISTRIB_DESCRIPTION="Ubuntu 14.04.3 LTS"
To avoid ERROR: The Nouveau kernel driver is currently in use by your system. Create file gen_pw.py, modify chars variable which is our characters dictionary. In my case I’m cracking password containing only digits.